While growing up in Hawaii, Sen. Barack Obama, the Illinois freshman on the Foreign Relations Subcommittee on Africa, was referred to as the kid with the funny name. He often jokes that people always get his name wrong, calling him "Alabama" or "Yo Mama." Supporters believe that one day no one will make that mistake. He is the only black in the U.S. Senate and the fifth African American senator in the country's history. Obama has been compared to Abraham Lincoln, Martin Luther King, Jr., and Bill Clinton. He was in national political wilderness until he received the spotlight on July 27, 2004, in Boston where he delivered one of the best speeches in convention history. There, Obama sold his vision of an America that was not "pockmarked by racism and fear and led by politicians born into privilege and coached into automaton." "In no other country on earth is my story even possible. I think that what people are most hungry for in politics is authenticity," he said. The budding potential Democratic presidential hopeful recently ended a two-week cross-continental trip to Africa. He started in the south, continued through the eastern Horn of Africa, visiting South Africa, Kenya, Djibouti, Ethiopia, and Chad, but canceled his trip to Congo and Rwanda on advice he received from the U.S. embassy in Kenya, which warned him of renewed violence in these unstable regions. Obama's unusual background is telling and germinates inspiration for minorities, especially African Americans. "He's all of us! He's not black! He's not white. He really drives breathless optimism among black and white, red, and blue. No one raises $14,500,000 because of his 'unusual background,'" a fan said. Why has he been so successful? His deceased Kenyan father, Barack Hussein Obama, had benefited from the famous airlift of Kenyans in the 1960's, and won a scholarship to further his education in Hawaii — spearheaded by a former Kenyan cabinet minister, the late Tom Mboya. He is not embarrassed by his father's goat-herding heritage. Once in America, his father paved his way to enter Harvard, graduating with an advanced degree in Economics. His father also met and married a Caucasian woman, Shirley Ann Dunham, from Kansas, Missouri. Barack Obama, Jr., was born of that union. But the couple divorced two years after his birth. His father later decided to return home and make a worthy contribution to his beloved homeland, serving as an economist in Kenya's Treasury department. Obama's parents are now deceased, but the young Obama never abandoned his roots, even though be barely knew his father. Men play a vital role in the welfare of a son in African culture. A true son would cue up for clan succession or inheritance. Obama traced his father's dreams by attending Harvard. The Founding Fathers' vision of a meritocratic America worked for everyone then. Does the system work for everyone today? "How do you leap-frog from neighborhood activist to U.S. senator to perhaps even higher office?" an ardent supporter wondered. The senator's success is more complicated than is readily apparent. Obama's African itinerary began in Cape Town, South Africa. There he toured the infamous Robben Island prison, where Nobel Peace Laureate Nelson Mandela endured most of his 27-year prison sentence, under a notorious apartheid regime. He spent time viewing Mandela's cell, and toured the Hector Pieterson Museum in Soweto where the cancerous seeds of apartheid had sprouted. Spending several days in Johannesburg, he met local AIDS/HIV activists but criticized local leaders for their tardy response to AIDS. He sat down with Nobel Peace Laureate Archbishop Desmond Tutu, the architect of the Truth and Reconciliation doctrine who was a victim of a nefarious, divisive, and racist system. Euphoria and a rousing homecoming celebration awaited Obama in Kenya. The tumultuous welcome consisted of wild drumbeats heralding a musical showdown that depicted only locally made instruments. It was an emotional visit, returning as he was to his African roots. Obama has shown real enthusiasm in tracing his roots and has visited his ancestral homeland twice, first as a youth and later to introduce his fiancée, Michelle, to his relatives. This was his first visit since being elected to the U.S. Senate. Roads were paved and elephant grass bushes were trimmed down in anticipation of a beloved son's return. A watertight security went into top gear, but the presence of armed security was not necessary. No one would plot to harm a beloved, legitimate son. Obama arrived on a chartered jet at Jomo Kenyetta International Airport with his wife, Michelle, daughters Malia, 8, and Sasha, 4. He was received by the U.S. ambassador, Michael E. Rannesberger, and his relatives in Kenya. The streets were lined with massive crowds from the airport into the city and villages: Boys climbed trees to get a clear glimpse of one of their own. A spirit of Obama mania was born. The swelling crowd seeking to get a glimpse of Obama created a traffic jam around the Haile Selassie-Moi Avenue roundabout. Local politicians asked, "How come we never get this type of crowd." Vendors were selling T-shirts bearing the slogan "Senator Obama, welcome home." Kenyans have renamed the local Senator Beer, "Obama." Obama's visit to his father's homeland captures symbolism and substance. He epitomizes a popular president from the West on a state visit to Africa. In his Memoir, "Dreams from my Father," he reflects on his first trip to Africa, in his late 20's. He cried beside the graves of his father and grandfather, despite the fact that he hardly knew them. His next visit occurred 14 years ago, when he was a fresh Harvard Law School graduate ready to begin his civil rights practice in Chicago. 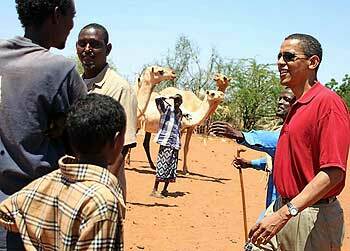 Kenyans took a keen interest in Obama and closely followed his 2004 senatorial election campaign. "He is truly a son of Africa, his election means something to them personally," Kenyan TV said. "Barack Obama was born to a Kenyan father who hailed from a sleepy little village in Kogelo, Siaya district. And this village will perhaps be more eager to welcome their son home." In Nyangoma-Kogelo, a tiny village in the rural west, chickens roam free and tiny boys in rags who tend their flocks have been preparing for weeks for his return. The dirt road leading to his 85-year-old grandmother's house was leveled. "Pave the way, Obama is coming. God has returned our son," the boys said. His grandmother, Sarah Hussein, who only communicates through an interpreter, treats him like any other grandson. His father, who rose to become senior economist in the Treasury department died in 1982 in a car crash. He left three wives, six sons and a daughter. Obama's grandfather, Onyango Hussein, was one of the first Muslim converts in the village. It was a happy homecoming and reunion when the senator arrived in his tiny village, where people know one another. Obama enjoyed warm embraces and long hugs among families, siblings, and elders. Grandmother Sarah said, "I am happy to receive him because I do not have to prepare what to cook for him….he is a down-to earth person. I will give him a meal befitting a grandson." She prepared a meal of eggs, traditional vegetables, and ugali in line with Luo customs. But she did not buy a new dress for the occasion. "Obama has always hugged me irrespective of what clothes I have on," she said. Students at the Senator Obama Secondary School rendered moving folk songs during his visit to their school. Principal Yuanita Obiero said the 78 students have perfected skits, narratives, verses, and a song to welcome a deserving son. After addressing the school, which is his brainchild, he admonished them to take education serious and to shoot for the skies. The students sang, "This land is my land, this land is your land," in their dialect amid drums and locally crafted musical instruments. "You have achieved fame and fortune. You are our inspiration," the children chanted thunderously. Obama and his wife, Michelle, took an AIDS test in his village where 700 people die of HIV/AIDS daily. This act of symbolism was made to attack the stigma and phobia associated with the disease. Witnessing him take a test, the villagers would be encouraged to come forward to be tested as well. Despite recent declines in the infection rate, 2,000,000 out of Kenya's 33,000,000 people are infected with the disease; 1,500,000 have died from it. This is the worst hit area. During his speech at the University of Nairobi, students who could not secure seats squatted on the bare concrete floor to listen to Obama's warm speech. Some took notes on the palm of their hands to avoid missing any salient point in his speech. He advised Kenyans to strive for more government transparency and eradicate corruption and ethnic politics, which could be a destructive malaise. Neither Kenya nor the entire continent have fulfilled their potential — the hopefulness of the postcolonial era has been replaced by cynicism and often despair, freedom is yet to be won. Many live on a few shillings a day or have fallen prey to HIV/AIDS, malaria, or those trapped in the crossfire of ethnic conflict, Obama said. He met a group of women over 50 who have adopted children infected with HIV/AIDS through a successful micro credit program, supported by his personal funds from a children's book deal. With an initial $14,000 investment, he enabled the women to get small loans to buy items like sewing machines, bicycles, and crops to help them start a business. He had an audience with President Kibaki, Foreign Affairs Minister Raphael Tuju, and leader of the opposition, Mr. Uhuru Kenyetta. Obama said, "For government to attract foreign investors, issues of democracy and transparency in government should be addressed." To M.P. 's who urged him to lobby the U.S. government to lift its travel advisories to Kenya, he said, "The advisories were a policy of the U.S. government that is applied worldwide without discrimination." Another issue discussed was the country's foreign debt, which the M.P. 's said was responsible for poverty in Africa. Visiting the slums, he saw firsthand poverty and destitution. He solicited the world's attention to the poverty in Africa touring Kibera, the biggest slum in the continent. This did not impede an electrified audience from giving him a befitting welcome with shouts of "Obama has come! Open the way!" The senator and his wife toured Mchanganyiko Women's Self-help Group at the heart of the slum. He said, next time I come to Kenya, I will come here. Youths sang songs in praise of Obama and ran ahead of his motorcade as it headed to Carolina for Kibera. "I will work with the government to bring more opportunities to this area. All of you are my brothers and my sisters," said Obama, charming the ecstatic crowd. Any country that develops does so because women are given opportunities and any that does not is because women are oppressed, he added. Health minister, Mrs. Charity Ngilu urged the senator to help the country access grants for HIV/AIDS drugs. "Giving us loans for drugs and equipment is not realistic … Intervene so that we can get grants," she stressed. Obama met Nobel Peace laureate Wangari Maathai. At Uhuru Park, they united in planting a tree. "It does not matter if you are Kikuyu or Luo, but people should work together to build the nation," the senator said. "I love you guys and Uriti uru [goodbye]" was his farewell remark. Riaga Ogalo an elder of the Luo council presented him with a walking stick and a traditional stool. His next stop was Ethiopia, where he visited displaced people who have suffered a devastating flood that left them homeless. The rains killed 600 people and displaced tens of thousands. The displaced people occupied sprawling tents and camped in Eastern Ethiopia. U.S. Navy personnel carried out relief operations into dire Eastern Dawa, and Southern and Northeastern Ethiopia. This shows the role the US military can play, he said. The U.S. Navy is part of the antiterrorism combined joint task force in the Horn of Africa, based in neighboring Djibouti. They set up 60 enormous canvass tents to house 2,700 displaced people. "This is a wonderful thing that the U.S. military has done," said Mohamed Noor, who lives in one of the city tents. People lost everything as the waters washed away their homes. Sen. Obama's African tour gave him a practical perspective of the plight of Africans, as he listened to their personal stories and grasped firsthand evidence of the struggles they endure daily. Reducing poverty and hopelessness could be an antidote toward curbing the problem of international terrorism. British Prime Minister Tony Blair, who is versed on the problems Africa faces, puts it aptly, "The state of Africa is a scar on the conscience of the world." Sen. Obama's passion for minorities and the underprivileged is deep-rooted and genuine. He turned down a lucrative law firm job to become a neighborhood activist. One of his admirers describes him as "A gift that keeps on giving."